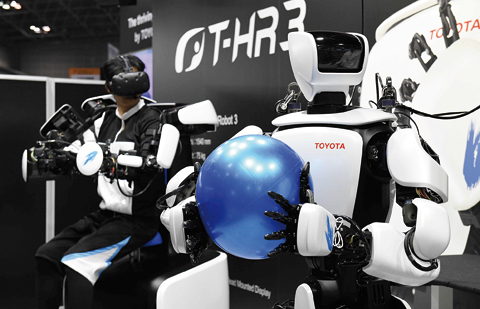 TOKYO: Japanese auto giant Toyota yesterday showcased a humanoid robot that can mirror its user’s movements, a product it says has uses as varied as elderly care and disaster response. The T-HR3 can be controlled by a wearable system that allows users to operate the entire robot in real-time by simply moving their own limbs. It is one of the main attractions at the International Robot Exhibition that opened in Tokyo on Wednesday. Toyota’s new robot is the latest in dozens of humanoid models that have been developed recently thanks to rapid technological advances, especially in artificial intelligence. “We are thinking about using this mainly for home elderly care and daily life support,” Akifumi Tamaoki, head of Toyota’s Partner Robot division, told AFP. “Technically, this robot could also be used in workplaces, disaster areas and outer space.” Robot-makers see big potential for their use in Japan, where the number of elderly people is rapidly growing, causing labour shortages in a country that strictly controls immigration. The T-HR3 has 32 joints and boasts smooth human-like movements. It can also balance itself in one-legged poses. Sensors on the robot can detect how much force it should exert on humans or objects. A head-mounted display allows the user to see from the perspective of the black-and-white prototype, which is 1.54 metres (5.1 feet) tall and weighs 75 kilograms (165 pounds). Toyota has no immediate plans to sell the T-HR3, whose development costs were not disclosed. In 2004, the company unveiled a trumpet-playing robot-its first humanoid machine-in a bid to catch up with robot technology frontrunners like Honda and Sony. Three years later, the carmaker made another robot that could play the violin as part of an effort to develop futuristic machines capable of assisting humans in Japan’s greying society.